Audioboom / R A Epstein: forced nationalizing of US bz (1 of 2) Supreme Court decision on labor unions in California: May California impose a contract on one private firm and its workers through nonconsensual compulsory arbitration? R A Epstein: forced nationalizing of US bz (1 of 2) Supreme Court decision on labor unions in California: May California impose a contract on one private firm and its workers through nonconsensual compulsory arbitration? Photo: XIV Amendment to the Constitution, due process clause: No state shall make or enforce any law which shall abridge the privileges or immunities of citizens of the United States; nor shall any state deprive any person of life, liberty, or property, without due process of law; nor deny to any person within its jurisdiction the equal protection of the laws. Richard Epstein, Chicago Law, NYU Law, Hoover Institution, on Gerawan Farming vs Agriculture LRB of California; the Employee Free Choice Act (which didn't pass). R A Epstein on forced nationalizing of US bz (2 of 2) Elizabeth Warren reaches into American corporate boards, directs who's on the board and how it conducts itself. 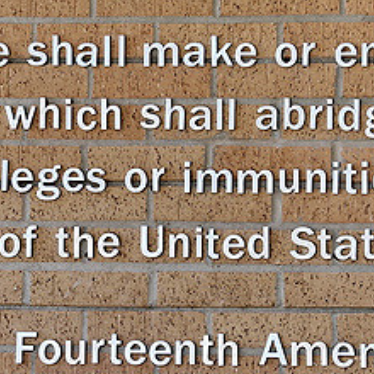 Caveat caveat: Due process and equal protection laws of the Fourteenth Amendment.